"This is rugged cowboy territory, terrain for game-hunting and songwriting. It reminds me of home in many ways, of the vast, panoramic outback of Australia, which has big skies of its own." And so, I find myself caught by the Bitterroot River in southwestern Montana. My mentor, Irv Weissman, is a world-renowned scientist who owns a ranch there, and every summer takes his entire research group for a retreat. 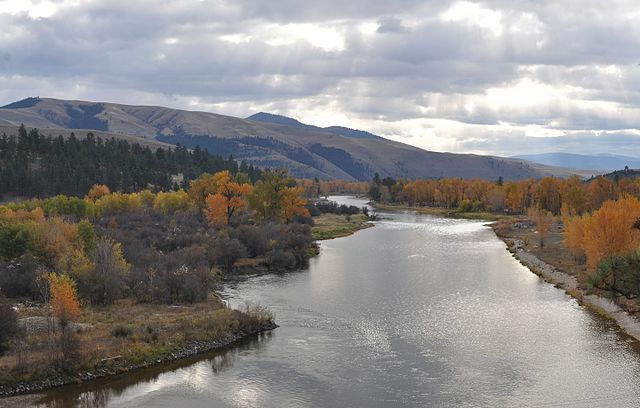 It’s a chance to unwind, to eat barbecue and drink beer around a campfire, and also to fish in the pristine waterway that cuts through the Bitterroot Valley. Irv is the son of a hardware store owner and grandson of a fur trader. His grandfather emigrated from Russia a hundred years ago to avoid being drafted by the czar during the First World War. Arriving as an immigrant at Ellis Island, he made his way west across America, eventually settling in Big Sky Country with family. Born in Great Falls, Irv’s great love is biology. It’s been his career and helped him see the world. He’s published over eight hundred scientific papers, given testimony before the US Congress on the merits of stem cell research, and even spoken with presidents on the topic. But even then, Irv still seems to prefer to talk about fishing, and especially in his beloved Bitterroot River. After a short early morning flight from San Francisco to Seattle, and an even shorter flight to Missoula, our group is bundled aboard a long yellow school bus and taken to the ranch. On the way, I see enormous mountain ranges and pickup trucks, and stores in Hamilton selling guns and guitars. This is rugged cowboy territory, terrain for game-hunting and songwriting. It reminds me of home in many ways, of the vast, panoramic outback of Australia, which has big skies of its own. Alighting from the bus, I hear wild rushing water splashing over rocks, and feel instantly at ease. Our host is already down by the water, clad in his trusty stocking-foot waders, indulging his love of fly fishing. I’m anxious to go down and see the indomitable river that Irv has spoken of so fondly but am instead given instructions to unpack, change into outdoor gear, and return to the bus. Is this a retreat or boot camp? We’re soon trucked to the nearby Bitterroot Range, which forms part of the imposing Rocky Mountains. It’s a tiring two-hour hike to the peak, past fallen pine trees and isolated lookout towers, but the views from the top are sweeping and spectacular. Craggy peaks, snow-capped even in the middle of summery August. There’s very little snow in Australia, and it’s gone by spring. Squinting into the distance, I think I can see Idaho. Raptors circle majestically overhead, grand, exotic birds with broad wings that I’m only familiar with as national symbols, bald eagles and hawks and falcons. It’s an unexpectedly awe-inspiring sight. For a brief moment, America makes a little more sense to me. Knees aching, we descend the mountain, badly sunburnt and slightly dehydrated. A few of my more weary colleagues fall asleep on the bus on the drive back to the ranch. They retreat groggily to their beds on arrival, in need of an afternoon nap before the evening’s festivities begin. The rest change into swimmers and wetsuits and grab truck tire inner tubes for a float down the river. But I don’t. I grab a water bottle and notepad and go sit by the water’s edge to watch a master at work. Clad in khakis, long-sleeved blue shirt, baseball cap and fishing vest, I find Irv up to his thighs in river water. Over his shoulder, ring-necked ducks float gently across the surface, occasionally plunging their heads under for a fossick and feed. The afternoon sun reflects off the river, making it shine like glass, slick and solid, but silky and wild. I kick off my sandals and feel the day’s residual warmth in the smooth white river stones beneath my toes. The sensation is not dissimilar to a relaxing foot massage, and instantly makes me smile. Irv sees me, waves; I wave back. I decide to keep my distance, to observe the proud Montanan in his element. He flicks his wrist expertly, back and then forward, casting his line out before lowering it down so that the grasshopper fly lands precisely as desired. I’m reminded for a moment of my late father and his own love of fishing. I was only a young boy at the time, being dragged reluctantly on excursions to lakes and rivers, to sit and watch Dad do nothing for hours on end. At the time, I wanted to run and jump and ride my bike, and didn’t understand the invisible tug-of-war at play, and the understated appeal of man versus nature. My current day colleagues don’t seem to grasp it either; having successfully obtained paddles and pale ales, they soon disappear down the river on their inner tubes, their sprightly voices growing fainter as the current carries them away. I see Irv smile at their boundless youthful energy before returning to his more peaceful pastime. Now approaching eighty, he no doubt sees life is a marathon, not a sprint, and knows that moments are best savoured when the pace is slow, unrushed. My dad, who lived to eighty-six, did too. And besides, all that noise and activity was scaring the fish. The US government classifies the Bitterroot River is a Blue Ribbon trout fishery, with a healthy population of native rainbow and brown trout. Cutthroat trout are plentiful too, so much so that they gave Irv’s homestead its name: the Cutthroat Ranch. Many glorious cutthroat trout have found their way onto his line over the years, and I try to picture them gliding like eels beneath the waterline, tempted by the brightly coloured lure drifting tastily above their heads. But none take the bait on this particular day, which leaves Irv bereft of both a catch and a story that he would otherwise have retold around the campfire. The seasoned angler strokes his irongrey beard, eyes the angle of the setting sun, checks his watch, and reluctantly calls it a day. With darkness approaching, pairs of glowing eyes will soon start appearing beside the river, most likely deer, moose and elk, to lap at the cool, clear water. Irv doesn’t want to be around in case those eyes should happen to belong to a hungry grizzly bear otherwise in search of its own haul of robust Montanan trout. And nor do I.
Pocketing a few smaller river stones as souvenirs, I make my way back to the ranch, following a respectful distance behind Irv who walks slowly with fly rod slung over his shoulder. I suspect he knows there’s always tomorrow – another opportunity to chance his luck in the mighty Bitterroot River that flows through his very backyard. Pete and his Stanford University research mentor Professor Irving L. Weissman published five research papers together between 2007 and 2015. Peter Papathanasiou was born in a small village in northern Greece and adopted as a baby to an Australian family. His writing has been published by The New York Times, New York Post, The Guardian UK, The Sydney Morning Herald, The Age, Good Weekend, The Canberra Times, The Herald Sun, SBS, The Huffington Post, Neos Kosmos, Frankie, The Pigeonhole, Caught by the River, Structo, 3:AM Magazine, Elsewhere Journal, Litro, Meanjin, Overland, Going Down Swinging, Verity La and Tincture Journal, and reviewed by The Times Literary Supplement. He holds an MA in creative writing from City, University of London, and has lived in New York, California, London, Greece and Australia.